good reading and listening on C.J.Q.S. 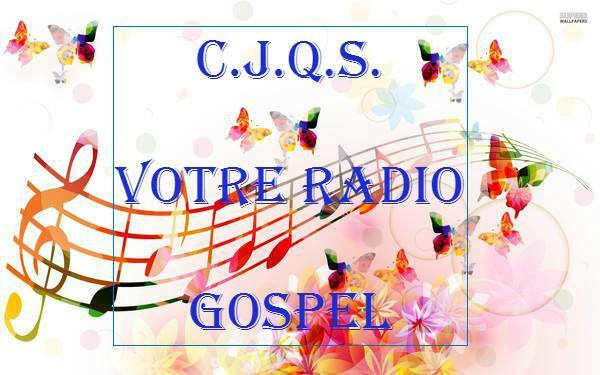 Your Gospel Radio at: http://cjqsradio.blogspot.fr/p/radio.html and remember the show Gospel Force at 16 am in Quebec + 6 am in Europe or + 7 am in Africa. In this program you will hear beautiful piece chosen English and French and come explore the universe of the Gospel of the 3rd Millennium Come. Be blessed. "For the word of God is living and active, sharper than any sword with two edges, penetrates even to dividing soul and spirit, joints and marrow; it judges the thoughts and intents of the heart "(Hebrews 4:12). The author of Hebrews reminds us of the power and effectiveness of the Word, when we allow him to act in our lives. It is the foundation on which our life believer is built and grows. Spiritual growth is related to the faith we have in God's Word. Paul wrote: "That is why we give thanks to God that when you received the word of God, we did hear you, you received it not as the word of men, but, as that it is in truth, the word of God which is in you who believe "(1 Thessalonians 2:13). Here the apostle emphasizes that it is the faith placed in God's Word makes it active in our lives: "Who works in you who believe." The Word of God is effective that if you believe in his message. This is because Paul knew the driving power of the Word he tells Timothy, "Preach the word; be instant in season, favorable or not, reprove, rebuke, exhort with all longsuffering and doctrine" (2 Timothy 4.2). When Paul preached the Word of God to the Thessalonians, they did experience the power of the Word: "For they themselves report concerning us what entering in we had unto you, and how you turned to God , from idols to serve the living and true God "(1 Thessalonians 1.9). Paul did not preach the doctrine of evangelical current or any Christian denomination, he preached the good news of God's grace, the epitome of the word. Do you want the Word of God to work in you? Start taking it seriously, believe in his message. Receiving in faith the Word of God, you open your hearts to act powerfully in you, for your salvation: "Therefore, rejecting all filthiness and superfluity of naughtiness, and receive with meekness the word that was planted in you, and that can save your souls "(Jacques 1:21). It is an inexhaustible source of wisdom, hope, comfort, support, guidance to lead us to spiritual maturity. » Où télécharger Word gratuitement ? » [Résolu] Word 2003: comment numéroter les lignes et faire des alinéas?